It's Facebook Fridays! for August 5, 2016, and we have a gift for you -- old-time hoodoo products to help draw to you whatever you want in the way of love, money, luck, favours, and friends! 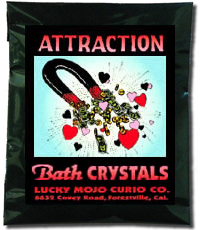 The Lucky Mojo Curio Company is holding a random sweepstakes to give away 5 Attraction spiritual supplies to bring in romance, fortune, wealth, and success. 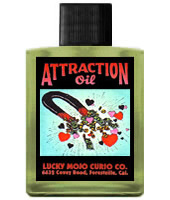 This week five lucky winners will each receive a bottle of hand-made Lucky Mojo brand Attraction Dressing Oil and a packet of Attraction Bath Crystals. First thing tomorrow morning, we will select FIVE winners at random, announce their names here, and ask them to message this Facebook Page with their mailing addresses, so we can send them their FREE Attraction products. And, folks, i hope you are all eetering the contest. There will be five winners this week -- check it out. We have a winner! In fact, we have 5 lucky winners! Our Facebook Fridays! winners for August 5, 2016 are: Georgie Lee Embert, Michelle Buck, Marilyn Maley, Krisli Hyland, and Ryan J. Misegadis.